I am excited to report that our recent mission trip to Glasgow and Edinburgh, Scotland was a huge success, thanks to the Lord’s mighty provision. When a great number of us arrived in London Heathrow, we were detained and individually vetted by immigration. There was grey area in the rules related to our need for visas, and immigration had decided to send us back home. I was told to prepare the orchestra members for the heavy news. I couldn’t believe my ears. 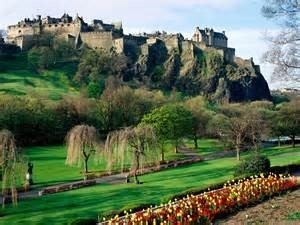 The Lord had laid Scotland on my heart two years prior to the trip. The musicians had taken vacation time and paid for the trip out of their savings. The two concert hall rentals were paid in full so that the poor throughout the cities could attend. How could the Lord now allow us to be sent home? I couldn’t bear to deliver the news. Instead, I asked the musicians to simply pray and ask the Lord to soften the hearts of decision makers. We found comfort in the remembrance of His faithfulness during challenging circumstances on previous projects in Russia and Australia, and we knew that His will would ultimately be done. After six hours of deliberation, immigration pulled me aside and reported that they had decided to make an exception and let us into the country. You can imagine the tremendous relief I felt to have this burden removed. Our initial days in Glasgow were spent playing in small ensembles, promoting our evangelistic concert events and leading worship in churches. The highlight of the trip came when we ran into three German musicians at a museum. Two of them, a violinist named Dorothee and cellist named Francesca, had played their instruments most of their lives. I invited them to join our project, and they accepted enthusiastically. One of the girls had recently been given a Bible by the Gideons, and she was searching for truth. By God’s provision, a Gideon from Nashville had joined our team last-minute, and this opened the door for ministry in this precious girl’s life. Members of the orchestra spent the entire trip ministering to these three girls and showing them the love of Christ in practical ways. We are still in contact with them today, and we are even hoping to work with them on our next project. One of the ministries that has been dear to our hearts over the years is being a blessing to sick children and their families. We were given the privilege of being the first orchestra to play at the Royal Hospital for Sick Children in Glasgow, both as a full symphony and in intimate, small-ensemble settings with families. We may never know this side of Heaven how the Lord has used our music and intentional conversations with those sweet people. Our events at the Glasgow Royal Concert Hall, St. Giles Cathedral and Usher Hall were comprised of symphonic arrangements of hymns and Scripture. Additionally, the concert hall venues included Faith Stories from members of the orchestra and an evangelistic message. Members of the audience were given the opportunity to accept Christ as Lord and Savior. It was such a joy to use our gifts to further the Kingdom. Will you prayerfully consider supporting this outreach, so that a presentation honoring our God can happen . . . again and again? Thank you for your openhanded response for this cause. Click here to make a tax-deductible contribution.